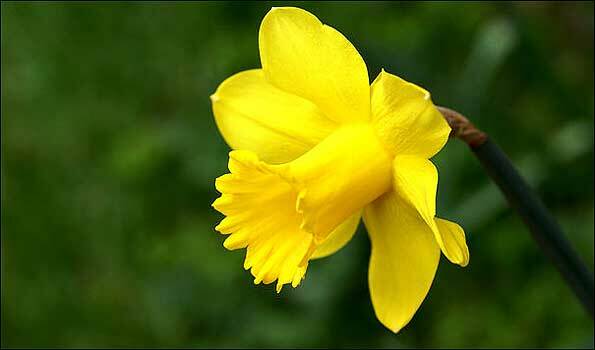 St Davids Day: Flower Experts gives you tips and advice on everything flower related. Wales celebrates its national day on 1st March which also remembers St David their patron saint. Traditionally nowadays it is customary to wear a daffodil in your buttonhole to show your patriotism and Welsh nationality although in earlier times a leek was worn to remember and celebrate a ruse de guerre when a Welsh army wore leeks to identify each other in a battle with the English. St David lived in the 6th century and spent most of his days in a monastery in Pembroke on or around St David's head on the coast. The Gulf stream passes quite close to here and its mild effect ensures that there are enough early daffodils produced here naturally to supply Welsh demand at home and in other parts of the UK.